If you’ve followed my blog, then you’ll know that I really enjoy making soup. Maybe it’s a millennial thing, but I find making soup to be really rewarding. Then again maybe you’re reading this and thinking “how lame can she be?” Whatever way you choose to look at making soup, the end product is absolutely delicious. 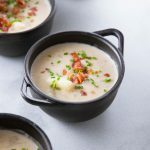 I chose to share my Easy Creamy Potato Soup with you and am excited by how well it turned out! My trick with any creamy, thicker soup is to start by making a roux. Combine equal parts of flour and butter (equal weights to be precise) in a skillet. Cook butter until it melts, then add flour. Continue to cook until there’s a slightly nutty aroma and the flours has cooked completely. I also stir my roux regularly as well because it will burn easily. Then whisk in milk, creme, stock until the liquid becomes thickened. This is an easy way to thicken soups and get that velvety creamy texture. Adding flour directly into the soup can work, but it won’t thicken as quickly and if it’s not cooked through, the flour will be raw or even clump together into lumps of paste. Another method is to create a slurry with cornstarch, which will work just as well and will omit the added butter. If you want to go all out and make this potato soup into a loaded baked potato soup, all you need to do is step up your toppings game. The base soup recipe will be the same, but feel free to add sour cream, cheddar cheese, scallions, on top as well. A little indulgence won’t hurt the soup but probably will only make it taste even better! When choosing your potatoes to make soup, be aware that not all potatoes are created equal. Red potatoes have a waxy consistency and shouldn’t be used for soup. Other varieties can get a glue like consistency when overworked or mashed. Use russet potatoes for the best results time after time. 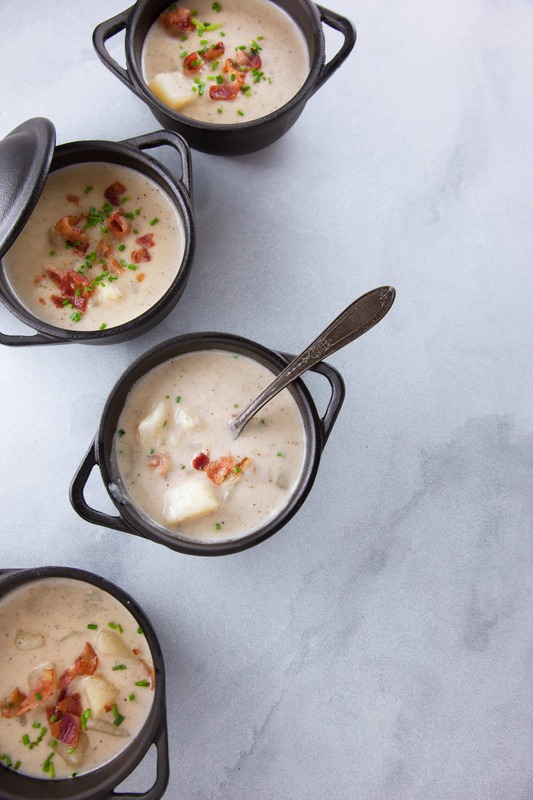 Cold Weather can be a drag but with delicious homemade Easy Creamy Potato Soup it doesn't have to be. Topped with bacon too!! Cook bacon to desired doneness. Remove from pan and place on paper towels to drain fat. Set aside. In a large dutch oven, Heat olive oil on a medium-high heat. Add onion, celery and garlic. Cook until softened. Add butter and flour, cook until butter is melted and flour is cooked. Stir in chicken broth and heavy cream, making sure that flour mixture has no clumps. Add potatoes, thyme and hot pepper, bring to a simmer and let cook covered for 20 minutes or until potatoes have cooked through. Remove thyme. Mash 1/2 of the potatoes in the soup either by using a potato masher or immersion blender. If soup is not thickened to your likeness by now, add in a cornstarch slurry and cook uncovered until thickened. Season generously with salt and pepper. 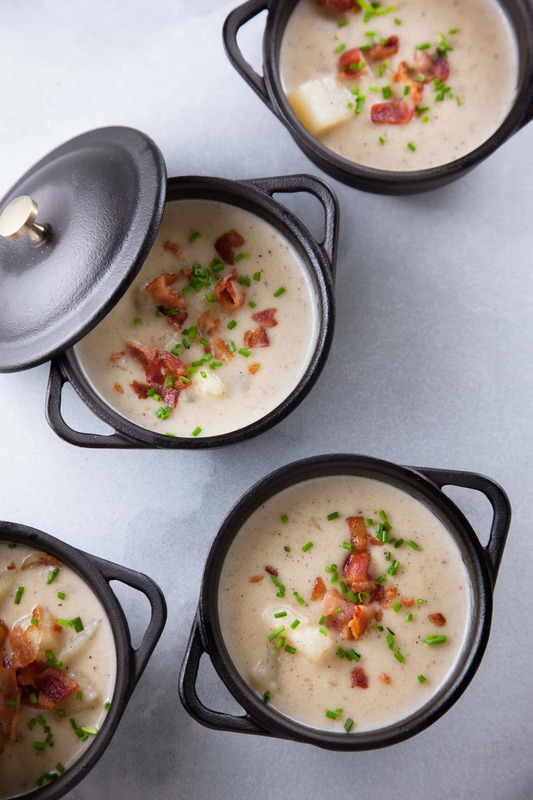 Serve with soup topped with crumbled bacon and fresh chive. Enjoy! 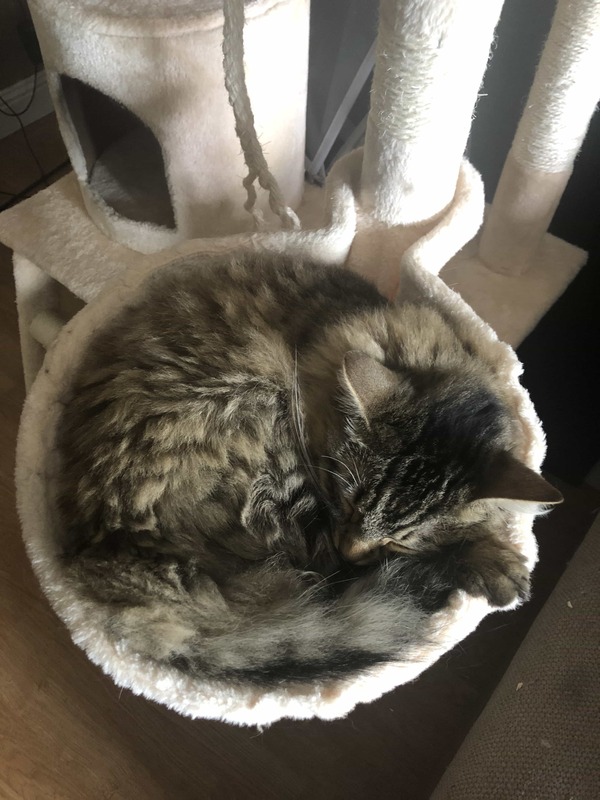 There’s nothing like taking a catnap on a cold day. If only I could do it as much as her! That looks amazing! 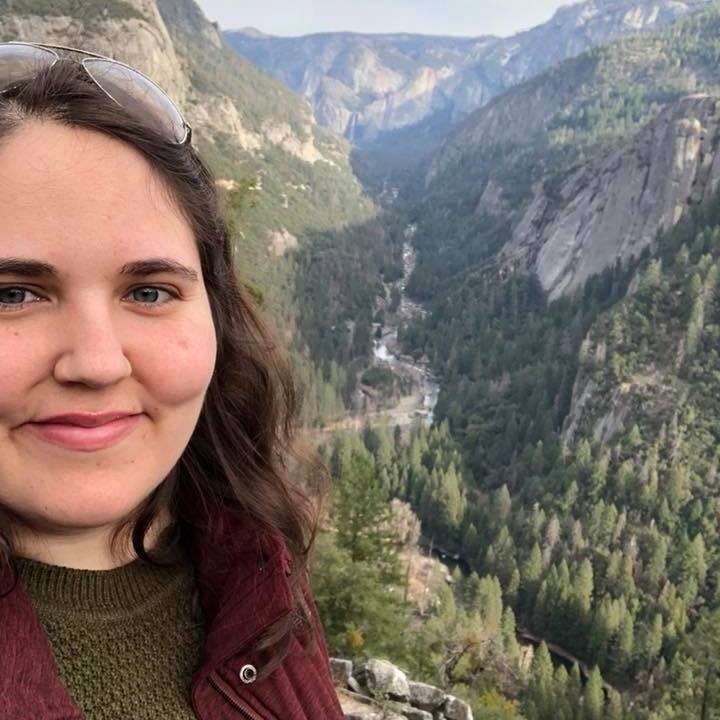 We’re about to get rain, and when it rains – we eat soup! This is going to be #1 on the list to make next! 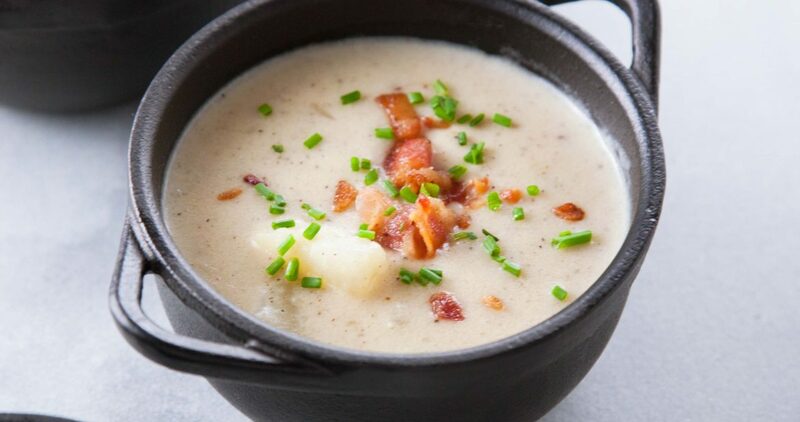 That loaded creamy potato soup looks perfect for the cold weather we are having here. I love that you added bacon, as bacon makes everything double delicious. Yum! 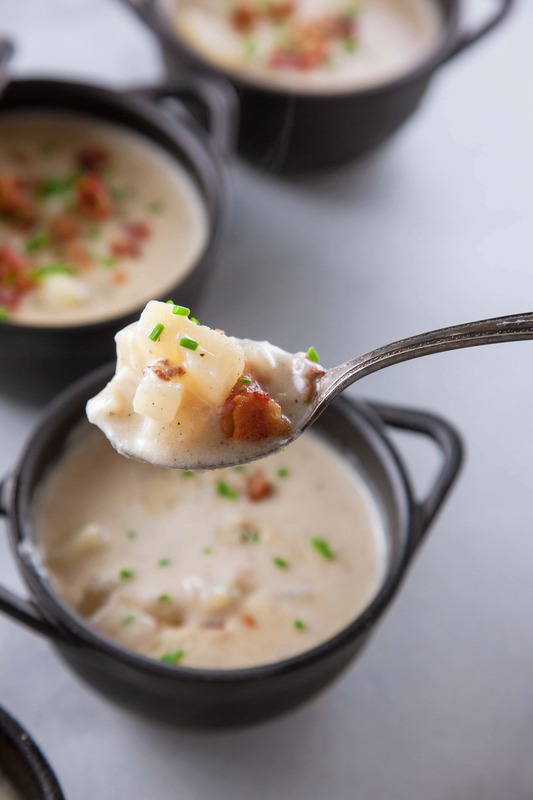 Can I have this potato soup for lunch today! It looks so hearty, tasty and inviting! My kind of comfort food! This soup looks so damn delicious!! Have to try it out! This is a good simple recipe, I am excited to try it. 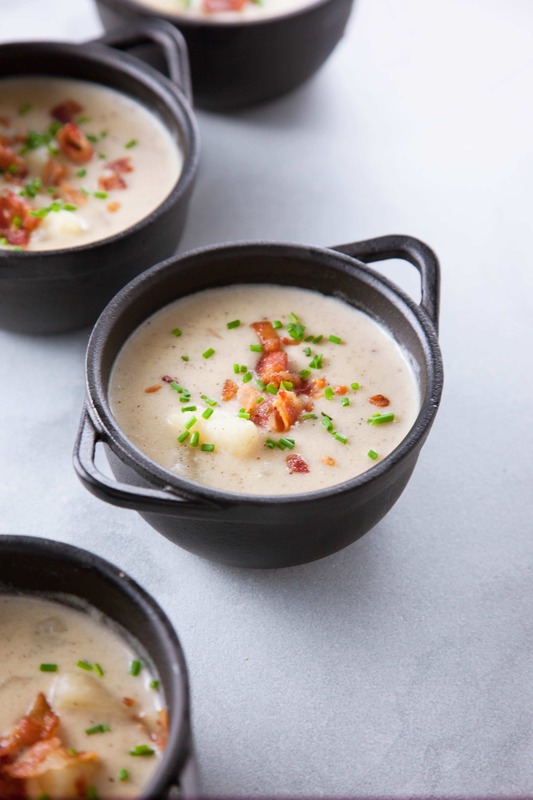 And… Ummm I didn’t know that there was any other way to have potato soup than to step it up with add sour cream, cheddar cheese, and scallions, LOL.